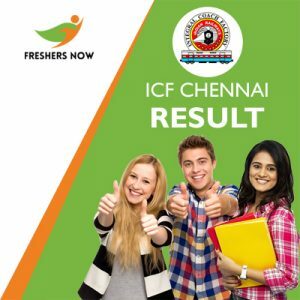 ICF Chennai Result 2019: The Aspirants eagerly waiting for the ICF Chennai Apprentice Result no need to worry anymore. Many people attended the Written exam this year, in this way, there is heavy competition. Accordingly, the members of the Integral Coach Factory, Chennai announced the Result Date as 13th February 2019. Also, you can get the exact link to download the Result from the official site. Remember that you can only check your result online from the official site. So, applicants should wait for some more days to know whether they are qualified in the Test or not. Along with the Integral Coach Factory Chennai Result, they also declared that 20th February 2019 is the ICF Chennai Apprentice Merit List release date. Hence a confusion for the applicants is gone by referring to this post. The link appears to the bottom of this page will be activated only when the results are out. As per the notice, there are 220 Apprentice Posts in the Integral Coach Factory, Chennai. Make a note, that the candidate’s Job location is Chennai only. So, this is a very good opportunity for the candidates who are dreaming to work in Chennai in the role of Apprentice. The candidates get their result by entering the Hall Ticket Number and Password in the webportal of the Official Site www.icf.indianrailways.gov.in. After completing the Exam, candidates are will be very eager to know their result. Moreover, the result date is released. Such that you need to wait with much more patience to know the result along with the Merit List. And then, can prepare well for the Further rounds and attend the qualifying process. Similarly, you can check for the process to follow while downloading the ICF Chennai Apprentice Result 2019. The Cut Off Marks are the minimum marks a candidate should secure in any examination. Hopefuls who want clear this examination have to score well as per the cut off list mentioned by the Officials of the ICF Chennai. ICF Chennai Apprentice Cut Off Marks depends on some factors such as difficulty level of paper, a number of candidates appeared in the examination, number of posts, the category of the candidate. However, the cutoff marks play a crucial role to select candidates. The category wise cut off marks are given in this section. It helps you to know your result and the qualifying status. The given table gives you the information about the Category Based Cut Off Marks. The Officials of the Integral Coach Factory, Chennai had declared the release date of the ICF Chennai Apprentice Merit List as 20th February 2019. Also, they calculate the Merit List based on the Applicants details present on the Registration Form and also, their highest score. Moreover, In the Merit List, all the details are present as per the highest marks scored by the candidates. Furthermore, some more details are given in the below sections. Move to the Official website www.icf.indianrailways.gov.in of the Integral Coach Factory, Chennai. Check for the ICF Chennai Recruitment 2019 on the Home Page. Next, search for the link of ICF Chennai Result 2019 and click on it. Now, Fill the details correctly such as Name, Password, Registration Number etc., for Logging purpose. Also, enter the Captcha if asked. Finally, you will find your Integral Coach Factory Chennai Result on the Screen. Then, download the Result 2019 and make a copy of it for future use. Hence, hope we provided all the details about Integral Coach Factory Chennai Result. For similar details, stay tuned to our website Freshers Now. Don’t hesitate to ask for questions in the comment section given below. Soon we will respond to you with answers and clarify your doubts. Thank you and wish you all Good Luck..!! !